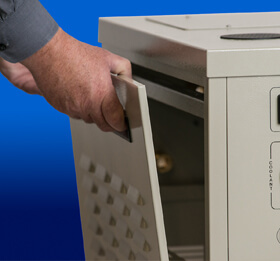 With its unique modular construction, the TKD-250 Chillers offer an extensive selection of control, monitoring, alarm, communication, and interlock options. In addition, extended temperature range equipment, and all-stainless steel and polymeric circulation systems are available. TKD-250 Chillers feature CFC-free refrigeration systems with compressor hot discharge gas bypass. 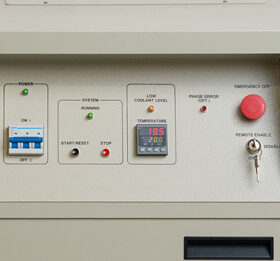 Stability to ±0.5°C is maintained with our standard temperature controller with digital display of process/setpoint temperature. If still tighter stability is required, these chillers can be equipped with our microprocessor-based temperature controller that is stable to ±0.1°C. The water cooled chillers use facility water to cool the condenser. This is generally quieter and does not release any of the condenser heat into the air. The standard units are based on facility water with a flow rate of 1.5 GPM per Ton of cooling and with an inlet temperature of 24°C. Contact Tek-Temp’s Engineering Department with any fluctuations in facility water flow and temperature to calculate the changes with specifications. All TKD-250 Series systems come standard with a coolant pressure gauge and a coolant level switch. Also standard is a flow/pressure adjustment value (these features are often optional with other manufacturers). 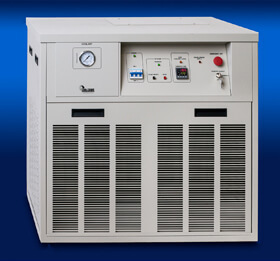 The TKD-200/250 Series Chillers are ideal for both OEM and end user applications.